So, I thought it might be fun to take a look at the routes we’ve taken in building around the same commander. “Standard Dereviation” is too good of a pun for me to pass up on, I’ll have to write an article about that some time. As a remnant of once being a Rafiq of the Many lead deck, my version doesn’t really like to attack all that much. While he goes for an all out assault for instant untap-y gratification to fuel Imperious Perfect and Thraben doomsayer, I sit back and keep him in check with things like Hands of Binding, Stoic Angel, and Ith, High Arcanist, only attacking with one or two creatures at a time while taking advantage of exalted triggers, double strike, and Finest Hour to make up for the lack of attacking creatures. One of the major changes I made when switching from Rafiq to Derevi was to add more mana rocks, giving it a mana base more closely resembling that of my Zur deck. Where I added mana rocks, he decided to use pretty much every recent variation of Llanowar Elves he could get his hands on because, of course, they attack and untap to make more mana. Another remnant of my deck’s former incarnation is that it was originally just a dumping ground for all of the legends I wouldn’t be able to use otherwise, eventually coming into its own legendary theme. Derevi combines exceptionally well with Sisay’s ability, tutoring for X+1 legendary cards per turn, where X is the number of instances of combat damage dealt. 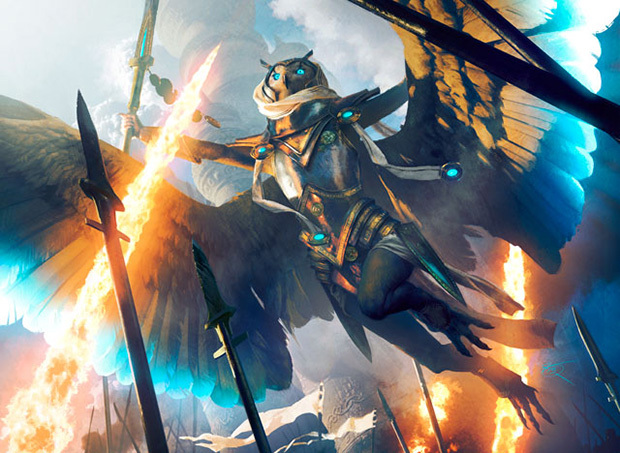 With further supplementation in the legends she can fetch (Reki, History of Kamigawa, Momir Vig, Simic Visionary, Sun Quan, Lord of Wu), the amount of value she accrues in only a brief time can easily get out of hand. His use of Birthing Pod comes primarily from the precon’s inclusion of Deceiver Exarch. With a mostly low curve, Exarch+Pod allows him to go up through the basic pod chain (Exarch, Phantasmal Image, Restoration Angel…) and quickly reach higher end cards like Azami, Lady of Scrolls and Arcanis the Omnipotent. What our differences ultimately come down to, though, are the main archetypes. We both run fairly aggressive decks, because that’s what Derevi does. The real question is who’s the beatdown, and more often than not, it’s not me. He backs up his strategy with combos Reveilark+Karmic Guide and Intruder Alarm+Thraben Doomsayer. As the slower deck, I try to keep his untapping in check by running a larger removal package and keeping him tapped down with Stoic Angel, Glare of Subdual, and Hokori, Dust Drinker. Token makers: He uses a decent amount more of these than I do with Imperious Perfect, Thraben Doomsayer, and the like. I only use two, Meloku the Clouded Mirror and Rhys the Redeemed, but their tutorability and ability to make swarms on their own more than makes up for their lower numbers. Massive Armies of Bigness (+1/+1 counters): Mikaeus, the Lunarch and Gavony Township are generally powerful staples for token decks; but even without a swarm, Mikaeus will gladly take advantage of Derevi’s triggers, making everything else bigger for every two hits you get in. Township is really just a good mana dump. Trading Post: Another card that’s just really good utility. With Derevi triggers, you can go through the entire cycle of abilities in one turn… Oh, and Goat tokens. Bident of Thassa/Coastal Piracy: Sometimes Azami isn’t available, so why not turn tapping Derevi to attack into a way to draw cards?